Skulls and bones are common motives in Salzburg. Whilst many tourists find that odd, skulls and bones were only two of many symbols in Baroque art that represent futility, vanity and death. The principle of ′memento mori′ (remember death) is key to understanding the seemingly cheerful and light art of Baroque. In fact, Baroque art liked to play with opposites, complementary things and imperfections - even the word ′Baroque′ itself plays with this principle. It refers to an imperfect and thus worthless pearl - a precious gem only if in perfect shape. 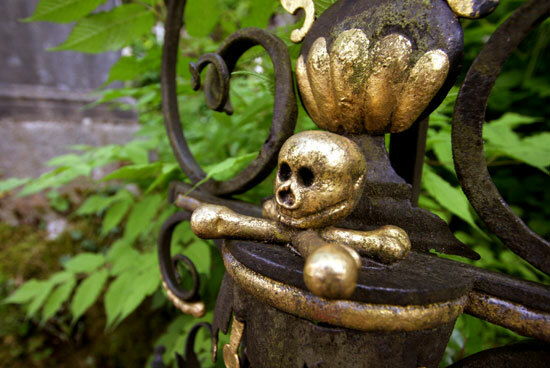 This detail was photographed on St. Peter′s Cemetery in Salzburg′s city centre.